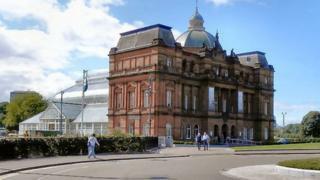 The People's Palace museum in Glasgow is set to reopen after almost four months. It closed its doors in December 2018 due to serious structural issues with the adjoining Winter Gardens glasshouse. Following a £350,000 programme of works, the city's social history museum will open independently of the Winter Gardens during the school holidays. The People's Palace has seen several alterations during the works, including the addition of a new cafe and shop on its ground floor, access to public toilets and a new fire escape, which was previously located within the Winter Gardens. Image caption The Winter Gardens remains closed until a decision is made on its future use. Councillor David McDonald, chairman of Glasgow Life, said: 'The People's Palace is just that; it's the official residence of the stories, the images, and the memories of the people of our great city, entertaining and informing Glaswegians with displays of how we lived, worked and played in years gone by. "There was an understandably strong reaction to the suggestions of the possible closure of the People's Palace, a clear demonstrations of its affection amongst the Glasgow public. So I'm pleased that it is now scheduled to reopen and vindicates our pledge that we would undertake the work to allow it to remain open while a long term solution is found to the challenges of the Winter Gardens. The People's Palace collection belongs to Glaswegians and we're glad they will continue to enjoy access to it." The current repair bill estimated to be £5-7.5m. Glasgow City Council is currently looking at how the Winter Gardens could be used in future, but no decisions have been taken at this time.